• Insider account of long range reconnaissance missions of 101st Airborne • Vivid depiction of fighting in the jungles of Vietnam Combat veteran Larry Chambers' timeless story of LRRPs in Vietnam is an unforgettable account of what it took it took to survive Long Range Patrol missions in jungles that the NVA considered their own. Unfortunately, due to sales rights restrictions, we cannot offer Recondo for sale in your country. 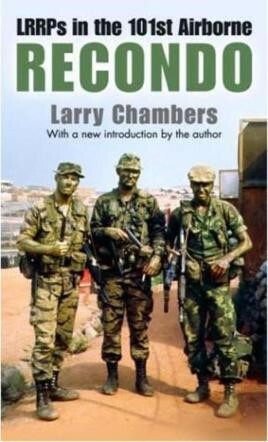 Combat veteran Larry Chambers’ timeless story of LRRPs in Vietnam is an unforgettable account of what it took it took to survive Long Range Patrol missions in jungles that the NVA considered their own. Now with a new introduction from the author, Recondo, vividly describes the guts and determination it took to pass the tough volunteer-only training program in Nha Trang and the hair-raising graduation mission to scout, locate, and out-guerrilla the NVA.